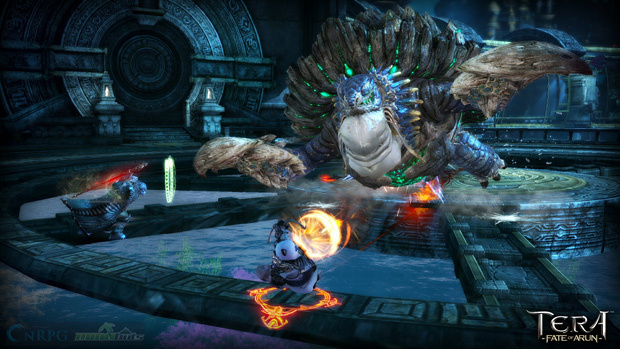 It’s been a long time coming, but Bluehole Studios and En Masse Entertainment is just about ready to release their first major expansion for TERA Online in over two years. The expansion known as “Fate of Arun” will update the game with the final continent in the realm of Arborea’s “Northen Arun” continent, along with an increased level cap of 65, new combat skills and so much more. It’s been quite a while since I had played TERA, in fact not sense their major PvP arena push in 2013. So I was incredibly excited to get back into the swing of things and see just what was coming down the pipeline with this expansion. Recently, I joined up with CM Treeshark, who gave me and many other participants a chance to get reacquainted with the game, as well as preview what to expect in this update. First off, they explained to us about all the new skills and changes that will be available for all classes, such as the Warrior’s new Binding Sword move that allows warriors to stun and chain multiple enemies together (just like Lancers can) or Berserker’s new Tackle skill that lets them charge a bolt of energy to hurl at enemies. Personally, I’m really digging the changes to the Slayer class, as they now have a new skill called Eviscerate that lets them chain an extra knockdown into their combo rotation, as well as be able to dodge attacks twice in a row. All of these changes mostly reflects Bluehole Studio’s strive to achieve gameplay balance among all classes, since now all classes have some kind of CC, ranged attack, gap closer or MP boosting skill on par with every other class. If these changes will reflect balance in the fields of battle still remains to be seen. 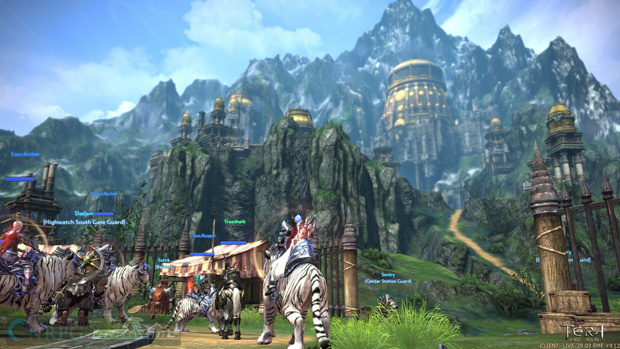 The first area we got to see in the new expansion was Spring Valley, a glorious valley for players to battle against LV61-62 monsters and BAMs, and as the story goes: This area is where a group of freedom fighters and refugees hide out from the deadly new archdevan forces, which are the central focus in the story for the expansion. This was the place where we also got to spread our legs a bit and re-sharpen our combat skills on trash mobs. It didn’t take long for me to get back into the swing of things, and I was also able to pull off my patented hitstun slayer combo against another player in a friendly duel. Sadly, I lost the fight, but I really gave my opponent a good run for his money. Next, we were teleported to an earlier zone in the expansion: Savage Reach, which players will be able to visit at LV60. 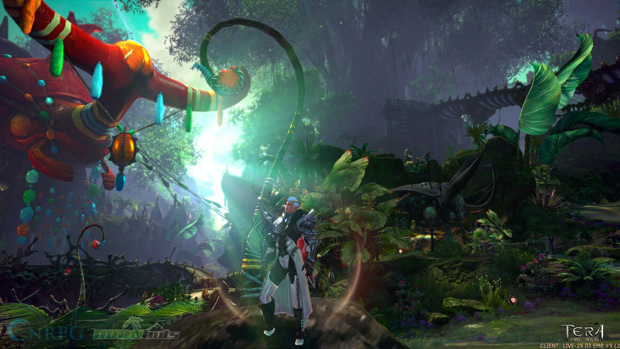 This zone features thick green jungles and is home to several new NPC races, including the savage but noble Khirians, and the brutal lizard-like guwangi. We took this moment to take in all the sights and sounds of this new zone, and it still blows my mind a little just how much visual splendor and detail that the art designers from Bluehole Studios have been able to put into this game. 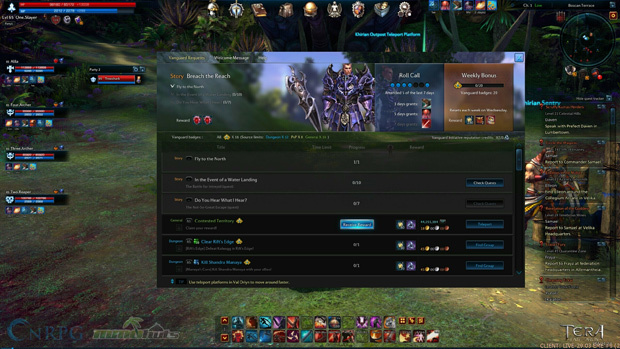 Treeshark also took the time to introduce a new Quality-of-Life addition to the game called “Vanguard Requests.” This new system will give players a daily to-do list of quests and objectives to complete. All players have to do to access these requests is hit the H key on their keyboards. Players will also be able to check their daily and weekly log-in rewards which include increased out-of-combat movement speed, increased HP and even increased attack damage, which are tied to all characters on a player’s single account. While it may seem a bit like hand-holding, this new system gives players a great sense of conveyance over where to go and what to do, ensuring that players will be able to maximize their playtime when logged in. Next up, we were teleported out towards the final zone in the Arun contentment known as Arx Umbra. 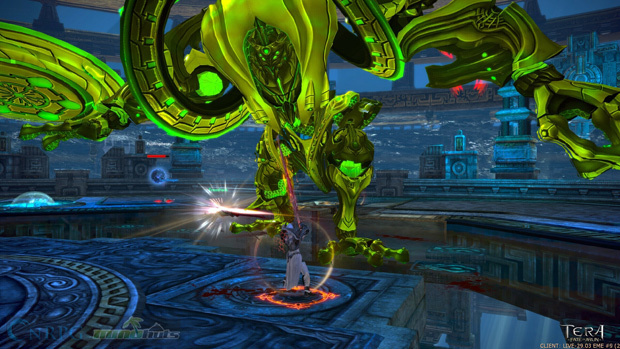 It sets the stage for the big showdown against Lord Dakuryon and his minions as players attempt to stop his evil goal. 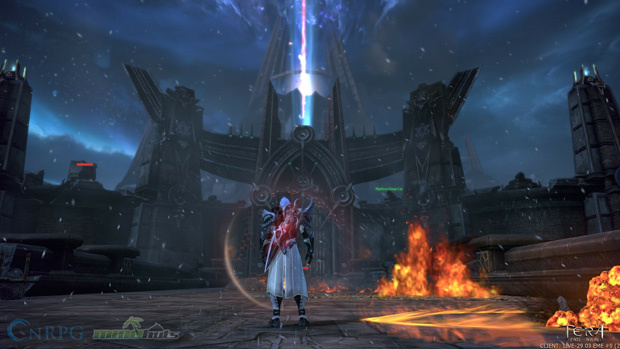 I won’t give too many spoiler details for all of those that are interested in TERA’s storyline, but I will say that it’s pretty damn evil, and that giant laser you see in the screenshot below will have something to do with it. But that was all the time we had for sightseeing. It was now time for some action! Treeshark then took us into one of the newest 5-man dungeons that players will experience in the new update called “Bathysmal Rise,” which is a unique, water-themed dungeon that will have players going through the most chaotic aquarium known to man. 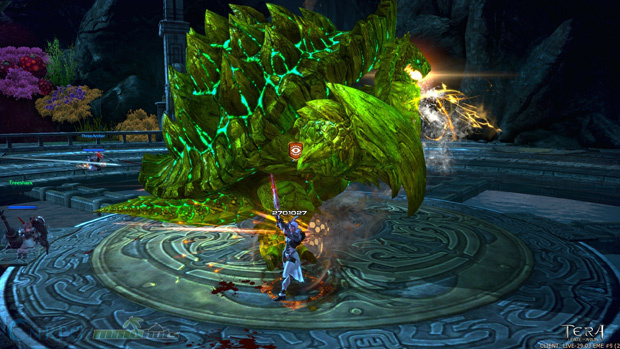 Just to give readers some insight on how the dungeon works: First boss up will be a giant turtle monster which uses several spinning and huge AoE strikes against players. 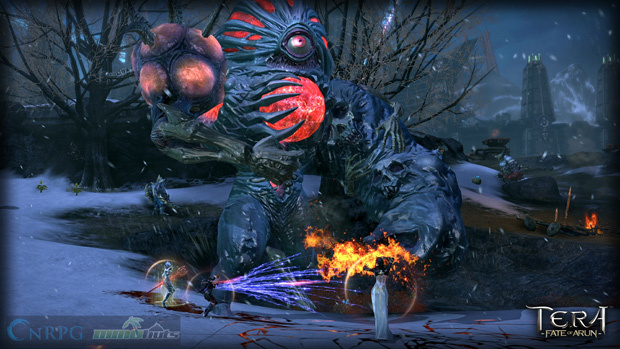 While this battle contains mechanics similar to boss fights such as the Cyclops in the Crucible of Flame dungeon, there’s also an opportunity to use the environment to your advantage, as the players will be able to destroy a set of rocks that are off towards the side of the arena to create a landslide capable of punishing the turtle. Of course, you need to time this move at the right time, but that will be up to you to figure out. 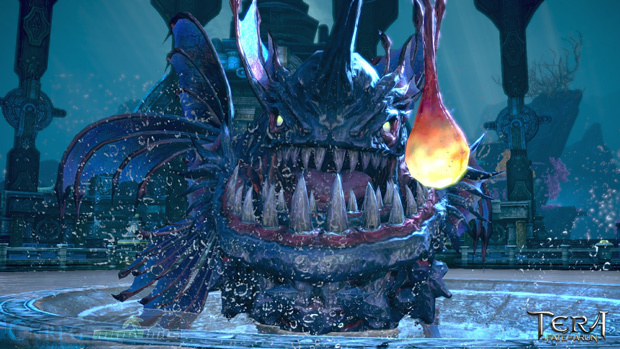 Next, for anyone that has fears of the deep dark sea should probably avoid the next boss, because players will have to do battle with an insanely fast Anglerfish which causes several different debuffs and poison effects to teammates. The only way to get rid of these debuffs is to cleanse yourself by swimming around in a pool that can be seen in the middle of the boss room. Last up, the final boss will challenge your twitch and dodging skills as players battle against a mystical creature on top of a floating water tower. 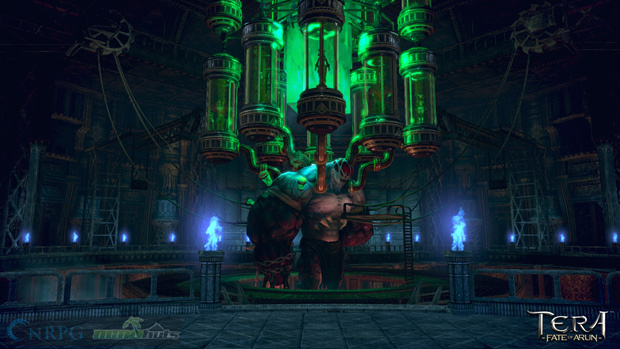 Players have to be quick on the draw in order to dodge spinning saw blades as well as proper positioning during key phases of the fight in order to prevent themselves from drowning, and so much more. What I got to experience from this tour was only a small taste of what this new expansion has to offer, and it will have something for everyone, new players and old. The new expansion will be here on December 16th, and I can’t wait to jump back onto my Popori Slayer once more.